About a month ago, after spamming my entire company with this blog, I was asked to make a cake for a co worker's daughter. Katy would be graduating from college, and Debbie wanted to surprise her with a motorcycle cake. Katy loves riding with her boyfriend on his Harley. I was a bit stumped at first on the execution and how to approach this. I still agreed though! To do a 3 dimensional bike or one flat on its side. I definitely wanted to create something with more than just a motorcycle on the board. 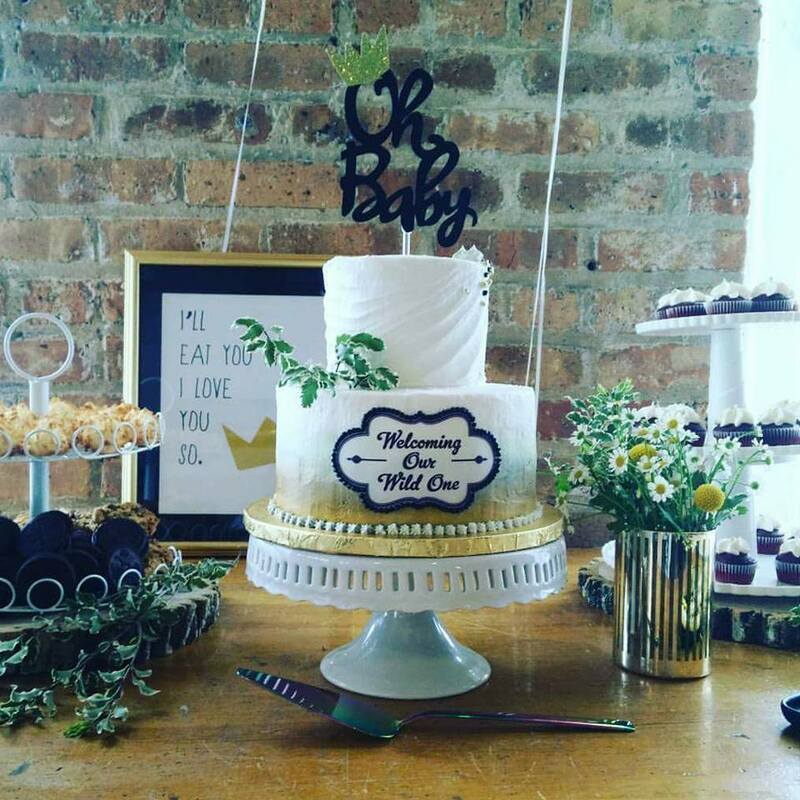 Being an advertising design major, I thought about the reason for the cake. Graduating from college is a huge achievement, and it leads to greater opportunities...to success! That's it! 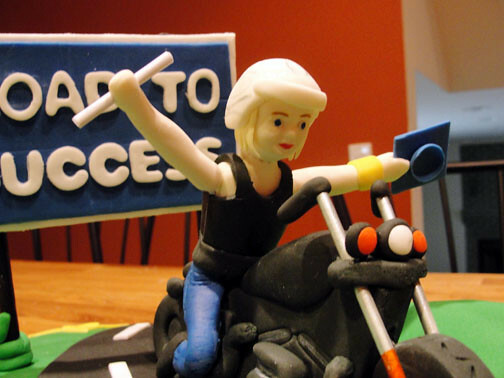 The cake went from just a motorcycle to a cake about her journey. As cheesy as it may sound, it was about her road to success...on a bike :) As fate turns out, while pitching the idea to Debbie, she tells me that her daughter had just purchased her own bike and new helmet. How perfect is that?! Debbie provides the photos that I would use as a reference, and let my creativity take over the rest. Two days before delivery, I started work on creating the gum paste and fondant model work. I started with the motorcycle and worked my way up to the miniature Katy. Black gum paste was use to create the base shape of the bike, and then major elements were attached on to create the recognizable form. Next were the two tires that were cut out of a thick sheet of gum paste with round cookie cutters. Small toothpicks help hold them in place as I attached the front wheels shafts and handle bars. Silver pearl glaze was painted on with a detail brush to mimic those on the actual bike. 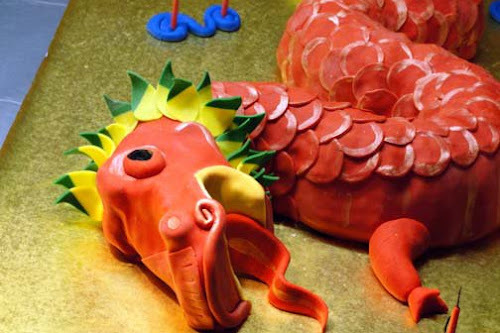 Katy was molded out of fondant mixed with tylose, a powder that helps fondant dry just as gum paste would. She was made in two halves and then attached together. Again, I started from bottom up, I positioned her lower body over the bike and attached her into position. Her torso was next. A single toothpick was inserted into the lower half and bike seat to hold up her torso. Like a paper doll, I cut out a tank for her to sport over her blue jeans. It's like a pattern for making clothes, two side seams that I would close up with a dab of water. Her head was made with a mold, and I hand painted the details of her red lips and blue eyes. I couldn't leave out her platinum blond hair blowing in the wind, even if it is covered by her new helmet. Using a small rounded rolling pin, I shape a ball of fondant over it's end and attached a small visor. The flames were painted on using the same silver pearl glaze... looks much like the real one! Her arms were attached on last after the graduation cap had securely dried on, and a small rolled up piece of paper was inserted into the other as her diploma. This was all left to dry in a safe place... no knocking into it! Now, it's time for some cake! Starting with a 13" square pan, I fill it with my Nutella inspired cake batter and set it to bake. This was such a huge pan that I had to monitor it carefully and not to let it over flow, or to open the oven to check on it too early. Even bake strips are good to have for something this size. Once the cake had completely cooled, I torted it and filled each layer with some yummy, gooey chocolate bavarian cream... adding to the Nutella flavor. Yum! The crown of the cake was carved to create hills on opposite corners, creating a flat center for the road. Once assembled, a crumb coat of buttercream was smeared over everything, making sure to not mash the hills... no flat plains here! Once the buttercream was allowed to crust, a lovely layer of green grass, or fondant, was laid over the top. This gave the cake a nice smooth finish. A curvy road was cut out of black fondant and was set weaving between the hills. Katy and her bike was then set on the cake with a dowel rod for support. The cake was not complete without the finishing touches of lane markings and greenery. 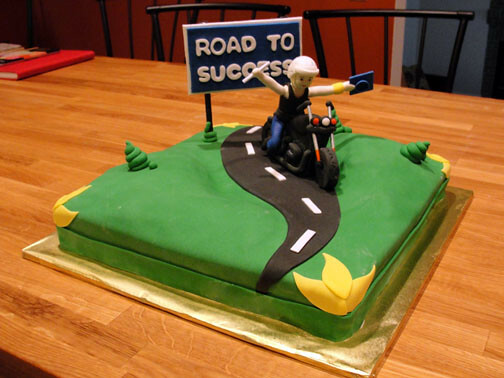 Let's not forget the road sign made from gum paste that says it best... a ROAD TO SUCCESS! Congratulations to Katy and I hope she enjoys it! Your cakes are amazing!!! It will be great taking the wilton class with you!